Tonight, the Street Art Works Association is presenting “Tunnel Vision”: A public art project. Tunnel Vision is a new public art project in the tunnel walkway which joins South and North Railway streets (under the tracks). This project features the work of many local artists who have are using the theme or genre of “street art”. Tonight, Friday, September 30th at 6PM, the Tunnel Vision artists and members of Street Art Works Association will gather at South Railway Street and move through the tunnel to North Railway Street, to present the first installation of this new public art project. Artists will meet with members of the public and the media to answer questions about the project, their approach and creative process. This event kicks off the Downtown Artwalk Roving Reception, which is also happening tonight from 7PM – 10PM as part of Alberta Arts Days celebrations. Street Art Works Association strives to work with artists and stakeholders to beautify the City of Medicine Hat with various projects and installations for the benefit of the public, visitors and the producing artist. The Esplanade Art Gallery is pleased to announce the opening of two new exhibitions, Michael Campbell’s Field Recordings of Icebergs Melting and Craig Cote’s Surfacing: Metaphor and Meditation, on display until October 23. 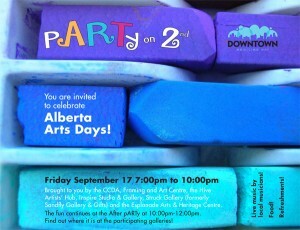 There will be a reception with the artists on September 30 at 7 PM, part of the Downtown Artwalk and Alberta Arts Days. Lethbridge artist Michael Campbell’s latest installation presents an eccentric flotilla of small ships – possibly sea or space-going vessels – that are made of driftwood and other ocean debris, weathered and recycled tin, metal strapping, and thousands of nails. Evoking retro-space fiction, Jules Verne’s 20,000 Leagues under the Sea, and west coast DIY aesthetic, Campbell’s engaging and poignant work also alludes to the exploration which brought Europeans to this continent, and the potentially catastrophic rising waters of climate change which could propel us into space in search of a new home, in the not-so-distant future. Michael Campbell lives and works in Lethbridge, where he teaches in the Faculty of Art at the University of Lethbridge. He also maintains a studio practice in coastal British Columbia. Campbell received a BFA from the University of Toronto and an MFA from Concordia University in Montreal, and he has exhibited in solo exhibitions at the Plug In Institute of Contemporary Art in Winnipeg, Zurich Art International 2003 and the Southern Alberta Art Gallery, amongst others. His work is held in public collections across Canada. Visit his website at www.burningcanoe.com. From 11:00am – 3:00pm on Saturday, September 18, the Historic Clay District is holding a fundraiser while making the museum, Squared Gallery and Shaw Centre open to the public at no charge. All proceeds from this event will go directly to Friends of Medalta Society. Food and refreshments will also be available. For Alberta Arts Days 2010, some of Medicine Hat’s potters have come together to create bowls and figurines which visitors will be able to glaze before being fired in a raku kiln. Raku is a historical pottery technique that originated in Japan. The pots are heated up to 1,000 degrees celsius relatively quickly (45 minutes). Once the pots reach this temperature they are taken from the kiln and plunged into combustible material such as sawdust. This produces smoke that reacts with the glaze to create truly unique surfaces that highlight the mysterious marks of the fire. The Esplanade Arts and Heritage Centre is pleased to announce that the artists’ proposals for the Alberta Foundation for the Arts competition for the commission of a public work of art are on display until January 28th. On Alberta Arts Day, September 6th, 2008, the Honourable Lindsay Blackett, Minister of Culture and Community Spirit, announced a partnership between the Alberta Foundation for the Arts (AFA) and the Esplanade Arts and Heritage Centre to commission a work of art in Medicine Hat. The partnership was accepted on behalf of the City of Medicine Hat by Mayor Norm Boucher. The AFA collection committee has approved a three-year grant totaling $150,000 in support of this commission. The work of art will be part of the Alberta Foundation for the Arts collection but will be located as a long-term installation in front of the north face of the Esplanade Arts and Heritage Centre. The commissioned artwork will be for the enjoyment of the downtown community, the Medicine Hat public and visitors alike. 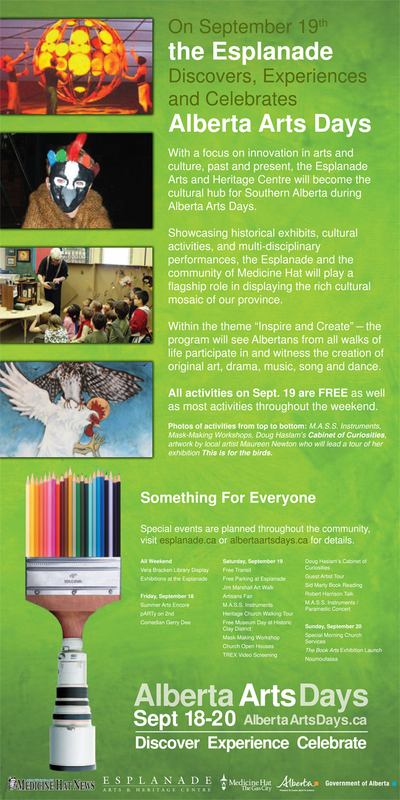 Alberta Arts Days is the celebration of art in many forms all across Alberta. From September 18th – 20th there are over 500 events in 100 different communities. Medicine Hat has been chosen to be a focal point for many of the events in Southern Alberta. Don’t forget, the reception for Maureen Newton’s “This is for the Birds” art show is Thursday September 17th (today) at 7:00pm. Reception is free of charge! The show started August 22nd and will run up until Sunday, October 11th, 2009 – so if you miss the reception, you still have time. It’s definitely worth checking out and events at the Esplanade on the 19th are FREE. You can visit www.albertaartsdays.ca for more details, they also have a Facebook group where other places are advertising how each community is celebrating. Even though I’ll be doing some work at the Esplanade for the Artisans Fair, I might just go over to the Tyrrell Museum and check out what’s going on over there this weekend. For a full (huge) listing of events and the details, go to the event listing page for Medicine Hat.